Named in honor of the Revolutionary War’s General Anthony Wayne, the Town of Wayne is located in northwestern-most point in Washington County. It borders Fond du Lac County to the north and Dodge County to the west. When European incomers arrived and settled the area, beginning in 1846, they found a dense hardwood forest. Much of the growth was cleared so that settlers could begin cultivating the land. Primary crops in the town’s early farming days included grains, potatoes, and apples. In the late 19th century, the town experienced a drastic shift in demographics; inhabited primarily by Irish settlers beginning in the 1840s, by the 1880s, the area was home to an almost exclusively German population. The Town of Wayne hosted several hamlets, including St. Kilian, Wayne Center, and Kohlsville (originally Kohlville); these small communities housed commercial centers serving the outlying agricultural areas. Because no railway passed through the Town of Wayne’s limits, the hamlets did not grow and were never incorporated as villages. Wayne Center (also called Wayne), Kohlsville, and St. Kilian remain recognized as unincorporated communities within the Town of Wayne. The Town of Wayne is governed by an elected three-person Town Board. Students living in the Town of Wayne enroll in the KEWASKUM School District. While Wayne Elementary School is located within the town limits, the middle and high school are in nearby Kewaskum. The Town of Wayne’s population remained small until the 1970s. From 1970 until 2010, the Town, which occupies 36 square miles in Washington County, experienced a surge in population, growing from 1,214 in 1970 to 2,169 in 2010. Despite this period of rapid growth, the Town of Wayne hosts the second-lowest housing unit density (22.3 units per square mile of land) in the county. Land use continued to be characterized predominantly by agriculture, with just more than 60 percent of the total land area of the Town designated as agricultural land. Today, a majority of the town’s land is zoned as either Agricultural Residential or as Lowland Conservancy, a designation marking preserved wetlands. The western part of the Town of Wayne is home to 2,078 acres of the 5,860 acre Theresa Marsh Wildlife Area. 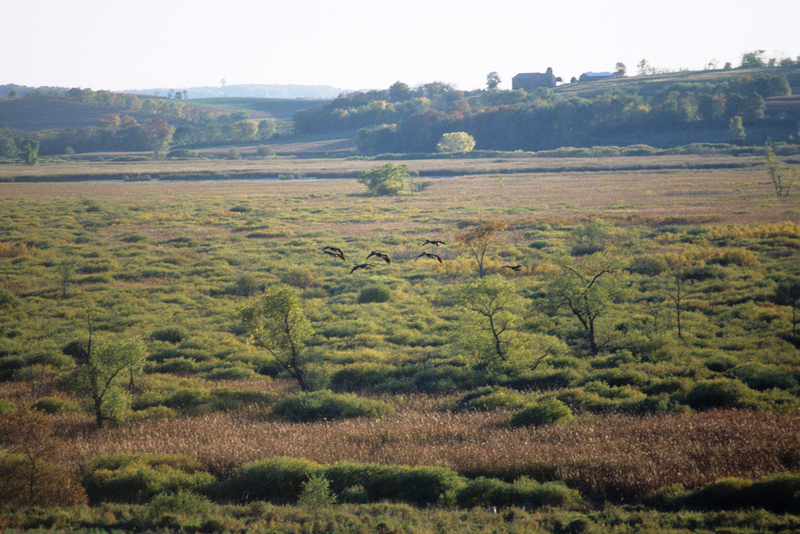 The marsh is managed by the Wisconsin Department of Natural Resources and hosts a diverse waterfowl population. ^ Winding through the Town of Wayne: 1848-1998 150th Anniversary (Town of Wayne, WI: n.p., 1998), 10-11; Southeastern Wisconsin Regional Planning Commission, A Land Use Plan for the Town of Wayne: 2020 (Waukesha, WI: Southeastern Wisconsin Regional Planning Committee, 1999), 2-3. ^ Winding through the Town of Wayne, 53; Southeastern Wisconsin Regional Planning Commission, A Land Use Plan for the Town of Wayne, 2-3. ^ Southeastern Wisconsin Regional Planning Commission, A Land Use Plan for the Town of Wayne, 39. ^ Town of Wayne website, accessed October 13, 2015. ^ Southeastern Wisconsin Regional Planning Commission, A Land Use Plan for the Town of Wayne, 44. ^ U.S. Census Bureau, 2010 Census of Population and Housing, Population and Housing Unit Counts, CPH-2-51, (Washington, DC: U.S. Government Printing Office, 1992), 40; Southeastern Wisconsin Regional Planning Commission, A Land Use Plan for the Town of Wayne, 11; “Wayne town, Washington County, Wisconsin,” American FactFinder website, accessed October 8, 2015. ^ U.S. Census Bureau, 2010 Census of Population and Housing, Population and Housing Unit Counts, 40. ^ Southeastern Wisconsin Regional Planning Commission, A Land Use Plan for the Town of Wayne, 42. ^ “Zoning Map of Town of Wayne, Washington County, Wisconsin,” Town of Wayne website, accessed October 13, 2015. ^ Southeastern Wisconsin Regional Planning Commission, A Land Use Plan for the Town of Wayne, 38; “Theresa Marsh Wildlife Area,” Wisconsin Department of Natural Resources, accessed October 13, 2015. Schulz, Donald, et al. Kohlsville Fire Department: 1908-2008. Kohlsville Fire Department website, http://www.kohlsvillefd.org/a-little-history.html, last accessed August 3, 2017. Winding through the Town of Wayne: 1848-1998 150th Anniversary. Town of Wayne, Wisconsin: n.p., 1998.